The Australian Property Income Fund has been established to accept investment from investors seeking to obtain an Australian Permanent Resident Visa under the Australian Governments Significant Investor Visa (SIV) programme. Under the SIV programme a complying investment requires a $5 million minimum investment in an Australian Securities and Investment commission (ASIC) regulated managed fund, which has an investment mandate in Australia. The Australia Property Income Fund is an ASIC regulated managed investment fund. The Australian Property Income Fund is required to be an Australian Regulated Managed Fund, and is structured as a closed ended unlisted unit Trust. The Fund is designed as a non-trading trust and will seek to maintain a non-taxable (Tax Free) status. Units in the Fund are redeemable at the end of the term by the investor. To provide investors with an Income return over the life of their investment, being 4 years in conjunction with the Visa application which may be extended by an additional two years at the discretion of the manager and a further two years by mutual agreement. The Funds income objective will be to pursue constant income returns from underlying residential investment in the Western Australian housing market sector. Australian Federal and State Governments National Rental Affordability Scheme (NRAS). NRAS is a $5 billion commitment by the Australian Government to provide tax free incentives over 10 years for the construction of 50,000 new homes under NRAS over the next decade. State Government backed housing investment opportunities; the Questus Community Infrastructure Fund (QCIF) was established to develop, deliver and manage affordable rental dwellings across Western Australia. The Australian Property Income Fund will provide investors with an Annual Return for the term of the investment. Investors will receive an interest coupon paid annually. The annual coupon will be targeted at 6%. Questus Limited is an Australian Securities exchange (ASX) listed company, which is 51% owned by Crest Capital Asia Pte Ltd which has over $1 Billion in funds under management. Questus Limited is Australia’s largest facilitator of affordable housing under the Federal Governments NRAS with over 4,300 entitlements for delivery of residential housing through to 2016. Questus Funds Management Limited is an ASIC licensed Australian Financial Services Licence (AFSL) holder and authorised to establish and manage Australian regulated Funds. Questus’s website: www.questus.com.au. The Australian Federal Government has launched a new visa pathway for migrant investors coming to Australia. The SIV Programme commenced on the 24 November 2012. The Visa rules are a simplified pathway to permanent residence for migrant investors seeking to come to Australia. The SIV has been introduced as a new stream to allow migrant opportunities into Australia. The SIV falls within the Business Innovation and Investment (Provisional)(Subclass 188) visa and the Business Innovation and Investment (Permanent)(Subclass 888) Visa. The Visa has the key requirement to invest $5 million into a ‘complying investment’ for a minimum of 4 years. make an investment of at least five million Australian dollars in a complying investment. Visa applicants do not need to satisfy the innovation points test and there are no upper age limits. The visa stream features a residence requirement of 160 days spent in Australia over four years while holding the Business Innovation and Investment (Provisional ) (subclass 188) visa. STEP 1: An intending SIV applicant must firstly make application for State Government Sponsorship, in the state in which they wish to invest. STEP 2: Following approval of State Sponsorship the applicant must make application via an Expression of Interest (EOI) under the Department of Immigration and Citizenship (DIAC) Skill Select programme. Business migrants may include family members and other dependent relatives on their SIV application. 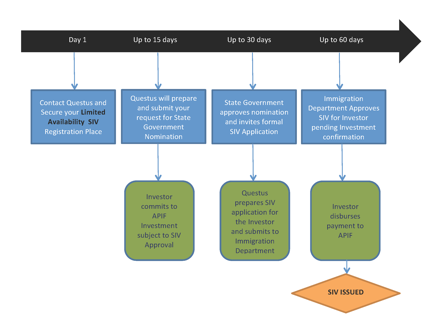 STEP 3: Following approval under the EOI, the intending migrant must make application for the visa and the investment of A$5 million in the Complying Investment. STEP 4: During the term of the SIV the visa is a temporary visa and is available for an initial term of 4 years and two further options of two years (8 years total). At the end of the SIV the investor may make application for permanent residency in Australia.